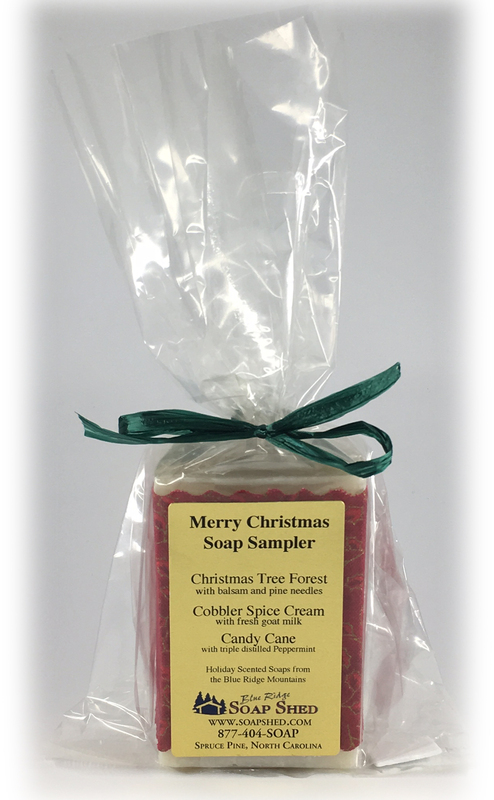 Each soap slice is approximately 1.5 ounces in weight, and individually wrapped in plastic and labeled so that you, or whomever will be receiving your gift, will know 'which soap is which' as you try each bar. When you know which soaps are your favorites, you'll know which ones to order from us in larger size or logs! Three handmade 1.5 ounce slices of our 100% Olive Oil Castile Soaps - Unscented Castile, Lavender Castile and Double Mint Castile. Four slices of our Shea and Cocoa Butter Hand Repair fragrances including Herbal, Jasmine, and Lavender. Three of the favorite soaps enjoyed by our female customers, one each of Southern Belle (with Magnolia, Gardenia and Rose), Kitchen Cook Scrub Bar, and Jasmine Quilters' Hand Repair Soap. Three 1.5 ounce slices: Grandma's Garden, Lavender Cream Goat Milk & Lavender Appalachian Crafter's Hand Repair with Shea and Cocoa Butters. Three of our handmade soaps for men, one each of Stud Bubbles, Spiced Plum Cream Goat Milk, and Bay Rum Hand Repair.